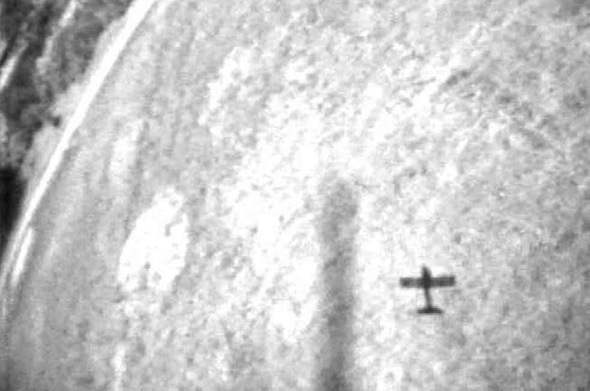 Trevor Paglen, Chemical and Biological Weapons Proving Ground; Dugway, UT; Distance ~ 42 miles; 10:51 A.M. (2006). 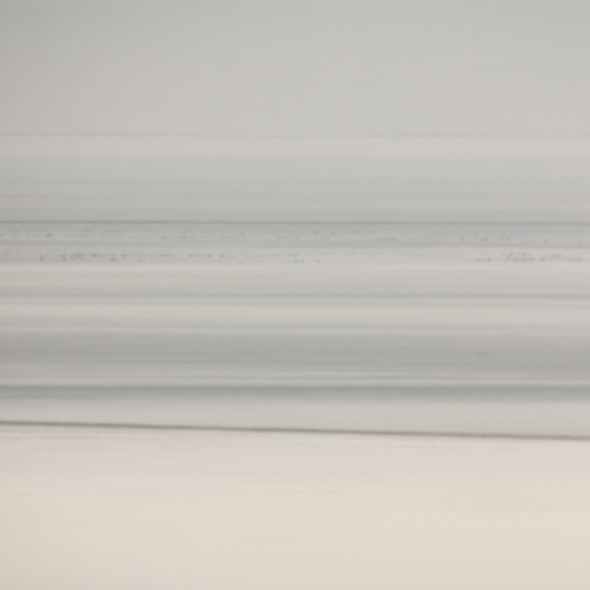 From the series Limit-Telephotography. Headmap Manifesto was a groundbreaking exploration of the possibilities of location-aware technology when it was released in 1999. A decade and a half later, many people have a wireless network device with them at all times, and the author of the manifesto seems to have disappeared from the internet. The landscape of our cities is irrevocably changed, as the data accumulates, erupting from our pockets and pooling in the network. This trajectory marked such technologies' arc from vanguard to status quo, but only as a rotation in a larger series of orbits. In 1983, the first call was made on the Motorola DynaTAC cellular phone, opening the way to a new topology of vast overlapping fields of radio antennas designed to carry us across a seamless virtual network. But there are larger orbits still, and new networks must always layer onto older ones. 1983 also marked the publication of critic and curator Lucy Lippard's book Overlay. Exploring the links between contemporary art and prehistoric sites and symbols, this wide-ranging volume of art criticism maps the way that humans connect with space and time, both old and new. Lippard's book is more relevant now than ever, as our maps are updated with new technologies and new works of art. It investigates multiple kinds of meaning that invariably intersect and make themselves known to us, popping up in pushed indicators from the terrain, forcing our awareness to shift. From ancient petroglyphs to ritualized performance, from bulldozing roads across the earth to saturating the airwaves with electromagnetic radiation, humans have always been in the business of altering our interactions with space, whether using a phone, a drone, or only our feet. For Lippard, time is the key—it is the dimension through which we can appreciate the changes that we make. It is where difference exists, as well as similarity and synchronicity. "Time, poised between the abstraction of distance and the concreteness of numbers, is in a sense the crux of this book, with its theme of forced synchronism," Lippard writes. The artworks that she tracks in Overlay are those that access time and manipulate it through space, by invoking human history, and by demonstrating how it acts on its environment. 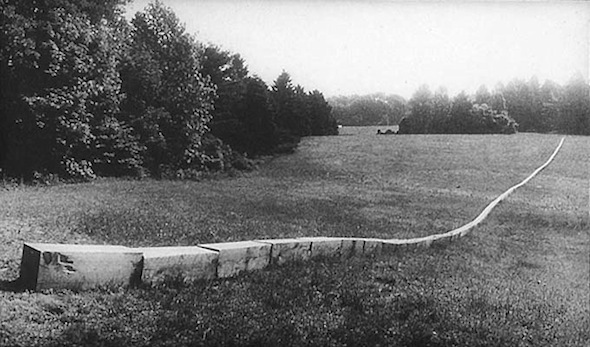 "My idea of a piece of sculpture is a road," Lippard quotes Carl Andre as saying. "We don't have a single point of view for a road at all, except a moving one, moving along it." Lippard places his long lines of hay bales and timber in Joint (installed in a field at Vermont's Windham College in 1968) and Secant (installed on the grounds of the Nassau County Art Museum in 1977) in context with Richard Long's performances of walks over Dorest and Peru, which are just as well represented by images of maps as they are by photographs. Long's walks evaporate from the land after he has completed them, while the land remains. Dorset is home to the Cerne Abbas Giant, and Peru to the Nazca Lines; these ancient geoglyphs plot a different time across the terrain—a lasting trace rather than an ephemeral motion. Historians can only speculate about the details behind their creation. Nevertheless, the geoglyphs share something with the work of Andre and Long. We view them both from the perspective of a map, as top-down inscriptions onto the landscape that overlay contemporary motivations onto pre-existing contexts. Time allows us to process information in a space, so that it might form context by lingering, forming a trace. Through these traces, we compare a place between the past and present, and learn to seek out more traces, investigating spaces in new ways, continuously searching for more information to aid our temporal picture. The concerns Lippard articulates in her 1983 text continue to play a central role in the work of contemporary artists who employ location-aware technologies. Clara Boj and Diego Diaz's Observatorio (2008) uses a modified telescope to visualize the presence of WiFi networks, overlaying new information onto the historical, architectural environment of Tallinn, Estonia. And even before drones fully entered public consciousness, Natalie Jeremijenko and Kate Rich hacked together some tools (a remote-controlled aircraft, a miniature video-camera and transmitter) to create BIT Plane (1997), offering a new vantage on the part of California now permanently labeled as "Silicon Valley," much of it off-limits to pedestrians. Like Andre and Long, these artists are concerned with landscape inscription and environmental context creation, but their works aim to make visible the hidden traces left by cutting-edge technologies, while also making use of them. Bureau of Inverse Technology (Natalie Jeremijenko and Kate Rich), Photograph taken by BIT Plane (1997) during flight over Palo Alto. While there are many continuities in the way artists have approached these questions, there are also important differences. What we inscribe into landscape is a political question. While in 1983 Lippard found that the pressing questions addressed by artists often involved the relationship between femininity, body, and the earth, today our data-bodies seem more concerned with questions of privacy and control. One work highlighted in Lippard's book was Ana Mendieta's Siluetas series, which projected the outline of her body onto personally and politically significant landscapes through various means, including stone, ash, fire, and blood. More recently, Ricardo Dominguez and Brett Stalbaum's Transborder Immigrant Tool (2007) used hacked cell phones to help immigrants safely navigate the US-Mexico border, dodging the extreme environment, the militarized border guards, and the violent vigilantes that would stop them. For his Limit-Telephotography (2012) series, Trevor Paglen traveled to remote landscapes to photograph secret government sites, which are more difficult to image than "the depths of the solar system," according to the artist. For Dominguez and Stalbaum as well as Paglen, the body (of the artist, or the migrant) must remain in the landscape, unseen, while the broader political systems in which they are enmeshed are made visible. Mendieta, in contrast, intended for her body to leave a visible mark, while the broader political context is implied rather than depicted. But what is similar in all these works is that they ask a political question of the landscape, layering additional knowledge over it, inviting us to view our surroundings similarly and engage them in political ways, whether digitally or carved in stone. 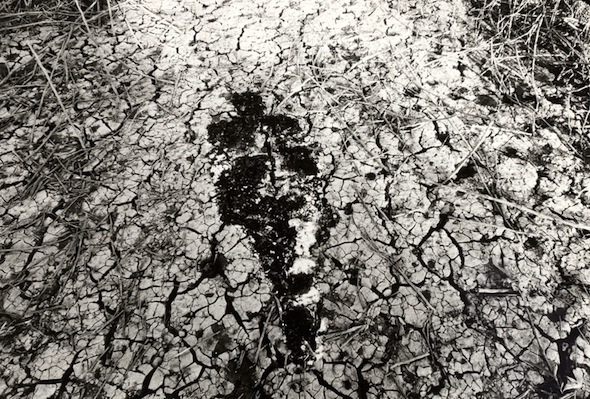 Ana Mendieta, Untitled (Silueta Series) (1978). Gelatin silver print, 20.3 x 25.4 cm. We might sum up Lippard's work in Overlay in her adaptation of the words of geologist Paul Leveson: that artists' task is "to interpret the earth to society, to bridge the gap between pattern and process." This is Nature, in prehistory or today—a stratification of humans' interactions with their environment, just begging to be interpreted. To study Nature in this way is not just the responsibility of historians or geologists. It is artists' and technologists' task to take this as an imperative, to interpret and to annotate and inscribe. Or, as the Headmap Manifesto puts it: "publish your morning walk somewhere."